Breeders, both Russian and foreign, are working to create varieties of strawberries are short day light, that is, plants that can give a very early crop of luscious berries. Displayed several varieties that are able to grow and bear fruits in the Central, and Siberia. One of the earliest is the strawberry cultivar "Alba". Under certain growing conditions it can give a friendly harvest in late may — early June. The berries of this variety of the correct conical shape and bright red color. A distinctive feature is that they are not shrinking over time, and have roughly the same size throughout the time of harvest. Very tasty berries dark cherry hue in the early grades "Cleary". The fruits are bright, shiny. Ripen in the beginning of June, when growing in the open ground. This strawberry Italian selection, so the plant is happiest in southern areas of our country. In moderately hot and humid season. Hardy and resistant to many diseases a sort of "Honey". It also gives an early and good harvest. The berries are sweet and flavorful, strawberry refers to dessert varieties. "Honey" is derived in the United States, but has been successfully grown in our country for decades. "Elsanta" - early Dutch breeders. Berries of strawberries juicy, sweet with a little sour. It is this variety in many countries is the standard of taste, with which to compare the others. However, when growing early strawberries in our environment, it is susceptible to frost, does not tolerate drought, resistant to wilt and mildew. 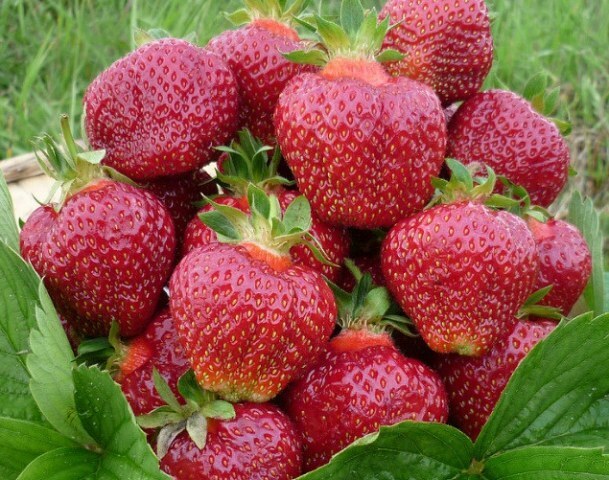 If you need variety, resistant to drought and winter frosts, you can choose strawberry of Ukrainian selection "Olivia." The berries ripen early. Strawberry provides a bountiful harvest of up to 1 kg per Bush. Shiny fruit, rich sweet-sour taste. To get early crop, it is not enough only to choose a suitable variety, you must give your plant the right conditions for fruiting and excellent care. The following methods will speed up the ripening strawberries. As soon as the snow melts, pour the planting of strawberries with warm water. Put your arc and pull the covering material or film, under the shelter strawberries will quickly go to growth. Note that the foil must not touch bushes, otherwise they can just burn out or damp out. In Sunny weather, periodically priotkryvaet film or covering material. The soil around the plants watered with warm water, and then multiroute compost. This technique will not only retain moisture for a long period, the plants will receive the nourishment they need. At the beginning of flowering and during the formation of ovaries and fed early strawberry slurry. Under every Bush pour about 1 liter of fertilizer. To protect the plantation against diseases, to regrowth of new foliage dry rake and burn them. Strawberries spray with Bordeaux liquid. As soon as the first leaves appear, treat the strawberry bushes with a fungicide. Dilute the drug as directed and spray them plant. This will protect the planting from strawberry mite and protect against powdery mildew.